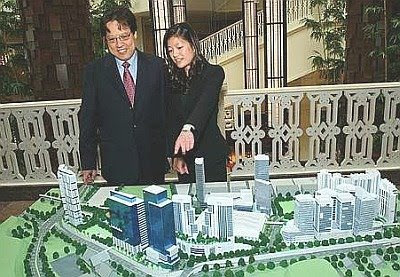 Ko and Chua indicating the location of St Regis hotel on a scaled model of KL Sentral. Hotels to some might seem like just like a place to spend the night in. To others, it’s an experience. And then there is St Regis hotels. This legendary hotel is said to house some of the finest politicians, CEOs and even royalty. “You can expect bespoke service in St Regis,” says Miguel Ko, president of Starwood Hotel and Resorts, Asia-Pacific, which owns St Regis. Bespoke means tailor-made, customised to their guests needs. “The St Regis experience is something that our guests keep coming back for. Our butler service is impeccable and they are attentive. If you’ve stayed in any St Regis hotel around the world, you can expect your favourite chocolates in your room that’s been turned down just the way you like it. We have a system that ensures our guest’s needs are all recorded down so you don’t need to say it twice. Our butlers have also been trained to take note of guests preferences. That is luxury,” says Ko. St Regis is the latest luxury hotel that will make its presence felt in Kuala Lumpur. The hotel will occupy the property owned by ONE IFC Sdn Bhd and this newly constructed property will include 200 guest rooms and 200 whole-ownership St Regis branded residences. It is slated to open its doors in 2014. This 6-star hotel is situated in the prestigious central hub of KL Sentral. “This affirms Kuala Lumpur’s and Malaysia’s sustained growth and potential, and is further proof that KL is ready to welcome a brand whose reputation for luxury is incomparable,” says Carmen Chua, CEO of ONE IFC during the signing ceremony with Starwood. Starwood is the world’s leading hotel group with almost 900 properties in 100 countries. Also in Starwood Hotels and Resorts’ extensive list of hotels is The Le Meridien, Westin and The Sheraton, just to name a few. “The St Regis Kuala Lumpur will have only 200 guest rooms and it’s exclusive and quiet. Guests can slip in and out, you have complete privacy,” says Ko. That’s the reason why St Regis in other countries boasts a guest list of important people like prime ministers, CEOs, politicians and the list goes on. “Our butlers are discreet and you wouldn’t even know they’re there,” explains Ko. “It doesn’t matter what these people are here for. Whether it’s for leisure or government mission, it’s not important WHY they’re here, but rather for WHAT they are,” says Ko. “Guests will come back for the comfort and privacy. It’s not like when you walk into the lobby and everyone knows you’re here,” adds Carmen. “As for the residency, it is targeted at the high-end condo dwellers who want the comforts of home but the facilities of a hotel. These properties have the St Regis brand, which is internationally recognised. This attracts foreign buyers who have the confidence in the St Regis brand. This is definitely a smart investment,” he says. The whole ownership units are sold as strata title land and comes unfurnished. “We have showrooms to give our potential clients an idea of how the unit will look like and they can advice their own interior designer,” Ko adds. “The rooms in St Regis Beijing have been fully booked for the Olympics since 2006. The guest list in the hotel is impressive as St Regis Beijing is without a doubt the most famous hotel in town. You can ask anyone and they will know where the St Regis is. It is the choice hotel for any visiting CEOs, politicians and even prime ministers or presidents,” says Ko. “We were pleasantly surprised when we found out that the Le Meridien (also owned by Starwood and located at KL Sentral) outperformed most hotels in KL city central. I guess once you think about the 45 minute jams getting out of the city, you’ll reconsider staying elsewhere,” says Ko. “To us, location has always been an important point. When we received reports about Le Meridien’s uptrend, we knew we have the place for our high end hotel,” says Ko. The KL Sentral transit hub features an integrated network of six railway that connects north to south (from Thailand to Singapore) – the KLIA Express Rail Link, the LRT, the KLIA Transit, KTM Intercity, KTM Komuter, Rapid KL and KL Monorail services. KL Sentral is also Malaysia’s only centrally located Multimedia Super Corridor cybercentre. Benefits include tax advantages, having an independent broadband gateway as well as an independent power supply. “With world famous New York-based Skidmore, Owings and Merrill architecture firm (who designed the Freedom Tower in New York and Burj Dubai in UAE) designing the building, we are assured that their expertise will match our shared vision of building a state-of-the-art tower in creating a new icon to complement the Petronas Twin Towers,” says Carmen. “SOM is one of the top three architectural firms in the world,” she adds. “Carmen and I were introduced by a mutual friend and business partner and we discovered we both share the same ideals,” says Ko, when asked about how the project started. “And when we decided to work together in bringing St Regis to Malaysia, we spent a year getting to know each other,” he adds. ONE IFC is 60% owned by CMY Capital Sdn Bhd, 30% by Malaysian Resources Corp Bhd and 10% by Jitra Perkasa Sdn Bhd. “ONE IFC’s commitment to the project also represents its confidence in Malaysia’s economy despite the current climate of uncertainty, inflation and rising costs,” says Carmen. The construction of the hotel, residences and office tower development is expected to start in 2010. The St Regis hotel has always been the choice for the discerning guests. From their resorts in exotic locations like the Bora Bora Resort or the Monarch Beach Resort to ski resorts in Aspen, you can expect nothing but the best. St Regis is founded by John Jacob Astor with the landmark St Regis Hotel in New York over a century ago. Since then it was known for its unrivalled dimension of luxury, bespoke service and refined elegance at the best addresses in the world. With new properties coming up in Atlanta- Buckhead, Baha Mar, The Bahamas, Bahia Beach, Puerto Rico, Bal Harbour and Deer Crest in North America; Buenos Aires, Costa Rica, Mexico City and Punta Mita in Latin America and plans to open properties in Bali, Bangkok, Jakarta, Lhasa, Macau, Osaka and Tianjin. St Regis will also make its presence felt in Cairo, Doha and Bahrain. KUALA LUMPUR: Sime Darby Bhd’s property division expects to rake in RM2bil in sales in the next 12 months following the launch of projects in nine townships. Sime Darby Property Bhd managing director Datuk Abd Wahab Maskan said the total gross development value of the projects was about RM10bil. Datuk Abd Wahab Maskan (left) with Sime Darby chairman supervisory committee (property division) Datuk Mohamed Sulaiman at the launch of Parade of Homes. “We expect the uptake of these properties to be good because they are located in mature townships with good infrastructure,” he told a media briefing on Sime Darby Property’s Parade of Homes yesterday. Abd Wahab said it might take about five years to sell all the properties, comprising semi-detached houses, bungalows, condominiums and shop-lots.The nine townships are Bukit Jelutong, Denai Alam, Putra Heights, Ara Damansara, USJ Heights & Pinggiran USJ, UEP Subang Jaya and Subang Jaya, Bandar Bukit Raja, Melawati and Nilai, Negri Sembilan. On rising raw material costs, Abd Wahab said the property division would find ways to mitigate the impact. “While the rising costs is a concern, it will not derail any of our projects. We have the size and economies of scale to ride through the difficult times in the industry,” he said. Sime Darby Property will also not discount the possibility of acquiring quality assets. “We are always on the lookout, but it’s not in our immediate plans,” Abd Wahab said, adding that Sime Darby Property still had 3,400 acres of prime land for development in the Klang Valley. SIME Darby Property Bhd plans to sell RM2 billion worth of new houses and shops in its high-demand townships in the Klang Valley this year, its chief said. It has a five-year plan to launch up to RM10 billion worth of properties in nine townships where development is ongoing, managing director Datuk Abd Wahab Maskan said. He said the company has no plans to delay property launches now despite the surging construction costs and a potentially slower consumer demand. Instead, its launches this year will be mainly in the established townships that are well located and are in high demand, he said. The bulk of the 2,000-odd new units will be launched within the high-end residential project of Bukit Jelutong and Ara Damansara, the mid-range Denai Alam, as well as the USJ Heights project in Subang Jaya. "There are some wait-and-see attitudes. The market is not going to be as strong as what we thought six months or a year ago," he said. "(But) our products are still in demand. These products are launched in the matured markets and they are more resilient regardless of the economic conditions," Wahab said in a media briefing in Kuala Lumpur. The developer yesterday started a 10-day showcase to promote the nine townships that it has been developing over the decades. Potential buyers get fee waivers and rebate for purchases during the promotion period. About 80 per cent of Sime Darby Property's sales is generated from Malaysia. It also has projects in Singapore, Indonesia, the Philippines, Vietnam, China, Australia and the UK. In Malaysia, the company still has 3,480ha immediately available for development over the next five years, Wahab said. The bulk of this, or 1,550ha, is in the Klang Valley and Selangor. It does not need to actively scout for land in Malaysia as the group has vast plantation lands that can be turned into property developments. The government's review of infrastructure and mega-projects under the Ninth Malaysia Plan (9MP) could see several projects put on hold, scaled down, or extended over a longer period, industry sources said. Projects will likely be prioritised based on necessity, cost, and urgency. Amid soaring costs and higher fuel prices, projects that would have the most benefits for the people would jump to the front line, they said. "The government is more concerned with rising food prices. So they will go for top priority projects which can generate growth, instead of mega developments. While this is a concern among industry players, we hope to be given a slice of the smaller cake," said one official of a public listed construction firm. The government had announced that 880 projects worth about RM15 billion will be implemented under the 9MP. So far, projects that have been awarded under the 9MP include East Coast Expressway Phase 2 comprising packages 10 and 12 (worth RM1.5 billion), Kota Kinabalu Airport upgrade works (RM750 million), Second Penang Bridge (worth RM3 billion) electrified double-tracking projects from Ipoh-Padang Besar and Seremban-Gemas (RM16 billion collectively), and Langat 2 Water Treatment Plant (RM4 billion). Projects that have been shortlisted but not yet awarded, meanwhile, include the Penang Outer Ring Road (PORR), Penang Monorail, Johor Baru Monorail, West Coast Expressway, flood mitigation, Pahang-Selangor Raw Water Transfer Project, Klang Valley LRT extension, and Selangor water treatment and distribution, worth RM28 billion collectively. One industry player said he believes the government may postpone flood mitigation and building of highways in Peninsular Malaysia, while giving the go- ahead for road and bridge construction works in Sabah and Sarawak. Some research houses, meanwhile, believe that PORR may be shelved indefinitely while the Gemas-Johor Baru double-tracking project could be postponed to 2009. "Under the Eighth Malaysia Plan (8MP), 30 to 35 per cent of the projects were delayed and carried forward to the 9MP. We are expecting the same for the 9MP, looking at the current political scenario and rising costs. "We believe the Ipoh-Padang Besar double tracks awarded to Gamuda-MMC could be prolonged from five to 10 years, and there may be some hitches in the Selangor water projects," an analyst said. The flow of project awards will also likely slow down for the remainder of 2008, which could put downside pressure on the stock market. "Most people have already factored in the news (project delays). The constraint now is that the government has a budget deficit level to meet and that level is 3.1 per cent of the gross domestic product in 2008. With this constraint in mind, they can't simply go around spending," said one analyst. The analyst said there is talk that the Penang Monorail project may be re-tendered and the development plan restructured under a build, operate and transfer concept or private finance initiative offering the company the concession. Another industry player said the government is expected to concentrate on projects which could benefit the public such as building new roads and improving the public transport system. "We believe the government may go ahead with the Klang Valley LRT extension. They may shorten the plan," he said. The LRT extension includes an extension of the Kelana Jaya LRT line to Klang, and a new outer-ring line serving the outskirts of the Klang Valley. BANGI: LCL Corp Bhd will focus on the Middle East as its key market for the long term as the oil-rich region is expected to see continued growth in construction activities. The company also planned to venture into North Africa, group managing director Low Chin Meng said after its AGM and EGM yesterday. “We are positive that growth in the MENA (Middle East and North Africa) region would persist in the next three to five years, thanks to its booming construction and oil and gas (O&G) sectors,” he said. Currently, LCL has a presence in India, Kazakhstan, Qatar, Dubai, Singapore and Brunei. “We expect overseas market to contribute 80% to group revenue for the financial year ending Dec 31, (FY08),” said Low. LCL is bidding for local and foreign interior fit-out (IFO) jobs worth RM5bil for hotels, complexes, serviced apartments and high-end condominiums. “We are confident of securing some of the jobs based on our historical success rate of 15%,” said Low. Shareholders at the EGM approved the company's proposed share split and rights issue. For the first quarter ended March 31, LCL saw its net profit and revenue more than doubled to RM10.1mil and RM103.25mil respectively. This is compared with RM4.13mil and RM50.15mil achieved in the previous corresponding period. “We will continue to pay a 10% dividend per share this year as in the past four years,” said Low. TSR Capital Bhd is riding on potential property developments worth over RM5 billion and another RM800 million of already secured construction orders to bolster earnings, its top executives say. The company expects earnings to swell further with some contracts from the RM1.2 billion of tenders it has submitted, chairman Datuk Yaakob Mohamad and managing director Datuk Tengku Mustapha Tengku Mohamed said. TSR has bid for open and selected jobs in infrastructure works, hospitals, training colleges, hostels and other building works, Yaakob said after its shareholders' meeting in Bandar Sri Damansara yesterday. The company is confident of securing at least one fifth of the tenders this year. "In the past, we have been able to achieve a success rate of about 20 per cent of the tenders submitted," Yaakob said. TSR's current construction jobs worth RM850 million will keep it busy for the next three years. The biggest contract is the RM251 million design and development of Penang prison in Jawi. TSR plans to expand its property development with its 273ha landbank in Selangor, Negri Sembilan and Kedah. The biggest job it is embarking on is a RM3.3 billion development of a medical city on a 148ha site in Negri Sembilan. Tengku Mustapha said the project will be jointly undertaken with TH Properties Sdn Bhd on a 70:30 basis. The Letter of Intent is expected to be secured by year-end. TSR is to develop a similar medical city for International Islamic University of Malaysia on 66ha land at the same area in Negri Sembilan. Development value is estimated at RM1.7 billion. TSR's revenue grew 58 per cent to RM233 million in its fiscal year ended December 2007, from RM147.8 million in 2006. Its pre-tax profit, however, eased slightly to RM10 million from RM10.7 million previously, due to higher material costs. Tengku Mustapha expects profitability to improve as prices of materials such as steel, cement, fuel and other building materials stabilise. The company is also reviewing its prices with clients, he added. TUNE Hotels.com Group has revealed an ambitious plan to invest RM2 billion in developing 100 no-frills hotels locally and regionally within the next three years. With two hotels in operation now, the group plans to build half of the hotels from scratch, said its chief executive officer Mark Lankester. It has identified locations in Ipoh, Penang, Johor Baru and Miri to open hotels, while regional locations include the Philippines, Thailand and Indonesia. "Our locations overseas include Manila, Clark, Bangkok, Pattaya and Phuket," Lankester said after the groundbreaking ceremony of its third hotel located near the Low Cost Carrier Terminal (LCCT) in Sepang yesterday. "We will be starting the construction of two additional hotels concurrently next month in Kuta and Legian, Bali," said Lankester. The investment per building is between RM16 million and RM20 million. He said the group is on track to meet its 40 locations acquired and under development by year-end, amid rising cost of raw materials. "We have to be much better in our marketing and filling up our hotel is the key goal. Then, the economics will take care of the rest," he said. Founder and director of Tune Hotels.com Group Datuk Seri Tony Fernandes said room rates will remain low and possibly reduced further when more hotels are opened. "As you get the volume, the cost will be tied to a larger number of properties," he added. The new Tune Hotel.com LCCT, with an investment value of RM20 million, is expected to tap into the potential 20 million passengers flying through LCCT. Fernandes said the location had the potential to house two to three Tune Hotels especially since AirAsia was still growing. "This hotel will be ready for those passengers staying overnight and catching the morning flight out," he said. Tune Hotels.com LCCT, due to open early 2009, will have 222 rooms with in-house food and beverage retail outlets such as Gloria Jeans Coffee, 7-Eleven and Nelson's Cafe. Malaysia Airports Holdings Bhd has leased the land to Tune Hotels.com for 30 years. This will be the third hotel, following the launch of Tune Hotel.com's flagship hotel in Kuala Lumpur and another in Kota Kinabalu. Hotels in Penang, Kuching and Bali are likely to be operational by year-end. SEPANG: Tune Hotels Regional Services Sdn Bhd has invested RM20mil in its new Tune Hotels.com LCCT, which is sited in the vicinity of the Low-Cost Carrier Terminal (LCCT). According to founder and director Datuk Seri Tony Fernandes, the hotel is targeted to open in early 2009 and would cater to about 20 million passengers a year at the LCCT. “The group aims to have 100 hotels up and running within three years and these would include sites outside Malaysia, such as Kuta and Legian in Bali, as well as locations in the Philippines and Thailand,” he told reporters after the ground-breaking ceremony for Tune Hotels.com LCCT yesterday. The Tune Hotels.com flagship hotel in Kuala Lumpur was launched in May 2007, followed by Tune Hotels.com 1Borneo Kota Kinabalu in April this year. Other hotels under the Tune.Hotels.com chain in Malaysia will be launched in Ipoh, Penang, Johor Baru and Miri. The new six-floor hotel at the LCCT would have 222 rooms, with the ground floor housing the lobby and food and beverage retail outlets. Meanwhile, Malaysia Airports Holdings Bhd senior operations general manager Datuk Azmi Murad said there was still “positive growth' in terms of passenger movements at the LCCT and KL International Airport. He said the overall passenger traffic grew 78% in April/May 2008 compared with a year earlier, while traffic at the LCCT was up by 30%. “For the third quarter, people have planned their travel. If there is a slowdown, it could be in the fourth quarter due to fare increases,” he said. MASTER Builders Association of Malaysia (MBAM) recommends that the government allocate RM1 billion to stock up on 350,000 tonnes of steel bars, to ease the current supply chain bottleneck in the construction industry. MBAM, which represents 600 contractors in the country, estimates that the country urgently needs 350,000 tonnes of steel bars in the next three months. "We're facing a supply chain bottleneck now because government projects were rolled out irregularly. "The sudden increase in demand for steel bars, cement and heavy machinery is causing artificial shortages in the market," said MBAM president Patrick Wong. Last week, Malaysia's five major steel millers, in a statement, said they are supplying steel bars at between RM3,550 and RM3,750 per tonne, cheaper than in Singapore, Thailand and Indonesia. "In de-bottlenecking the supply chain in the construction industry, we appeal to all steel millers to (bypass distributors and) directly supply the steel bars to contractors who are capable and willing to buy for cash," he told reporters at a press conference in Kuala Lumpur yesterday. "We're also recommending that the government, via the National Price Council, Syarikat Perumahan Negara or even Mavtrac Sdn Bhd, to set up a stockpile of 350,000 tonnes of steel bars now," he said. "If there are no immediate positive measures taken, we can see further delay in infrastructure projects," he said. Wong said the construction of affordable housing, including low- and medium-cost units, may no longer be feasible. "Each low-cost unit requires 1.8 tonnes of steel bars. If, by the end of the year, steel bars escalate to RM5,000 per tonne, the ceiling price of RM45,000 on a low-cost unit will no longer reflect its real economic value," he said. Wong reiterated that the association's appeal to the government is to incorporate price fluctuation clause in all government contracts. "Right now, only the Public Works Department's Form 203 provides for price fluctuation clause. All other government jobs do not allow for cost pass-through," he added.